The fall season is just one short month away and soon we’ll be breaking out our light sweaters and sipping hot drinks while watching the leaves change. 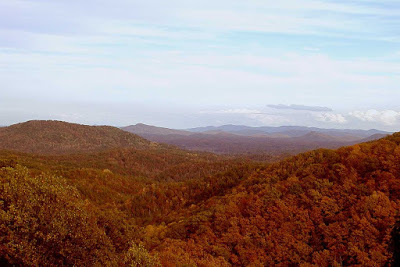 The North Carolina mountains have fall foliage that can only be described as excellent. And, well, OK, the fall foliage in the Asheville area can be described a lot of ways…and all of these ways make us excited to see autumn just around the corner. Western North Carolina has something like 100 different species of deciduous trees (the type that change color), and elevations ranging from 1,000 to 6,700 feet in less than 60 square miles, which makes for a long and beautiful fall season. Often, color can be found somewhere within 30 minutes of the Inn on Mill Creek B&B for more than six or seven weeks. 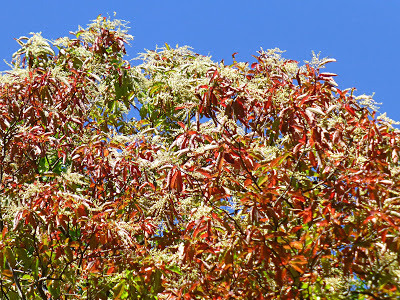 You will start to see bright pops of color as early as mid-September, courtesy of certain shrubs and trees, including blueberry bushes, burning bushes, and sourwoods. Goldenrod, bright red Cardinal Flower, and native asters will also be blooming by then. 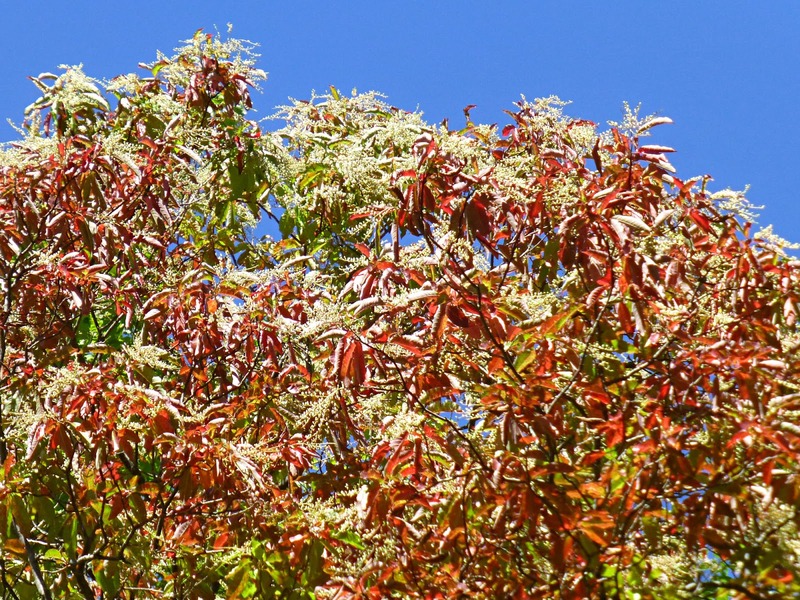 During early October, trees at elevations higher than 5,000 feet will start changing noticeably, with lower elevations seeing color changes gradually throughout the month of October. 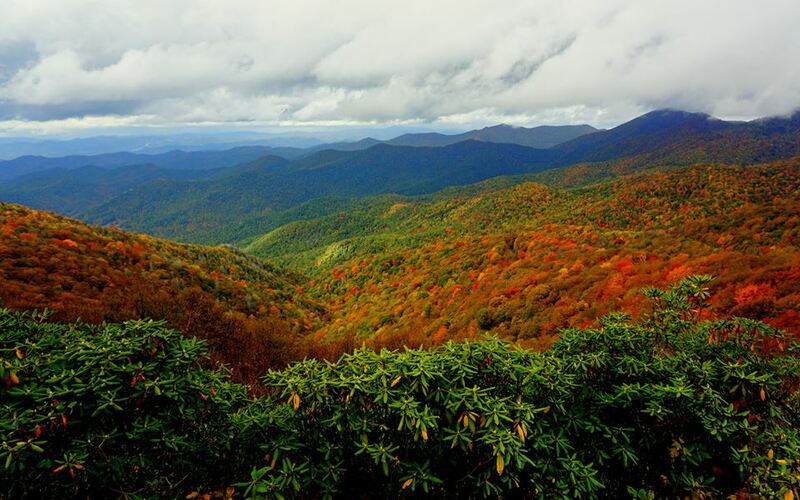 The best time to drive the Blue Ridge Parkway to see color ON the Parkway is mid-October. Any later, and you will be past peak on the Parkway, but will be able to see color at the various overlooks that offer expansive views of lower elevations. 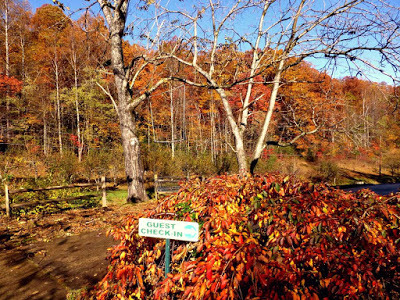 Peak fall foliage at elevations between 2,000 and 3,000 feet, including Asheville, the town of Black Mountain, and the Inn on Mill Creek B&B, is generally sometime during the period of October 21 and October 31. In the eight years we have been here, it has almost always been toward the later end of that timeframe. This doesn’t mean that all the leaves change color at once and then fall off the trees the following week, no. It is always a gradual change because there are so many tree types. For instance, the trees on Bernard Ridge bordering the Inn on Mill Creek B&B to the east change before the trees on Horse Ridge, which borders us to the west. Why? Because Bernard Ridge has more birch, maple, sourwoods and beech trees, all of which change earlier than the oak trees that dominate Horse Ridge. And the fall color show does not conclude at the end of October, no siree! The Chimney Rock Park area, 30 minutes south of the Inn on Mill Creek B&B, sees it’s peak fall color during the first week or two of November. So fear not, if you will be in the Asheville, NC, area during the month of October into early November, you will see color somewhere within a 30-minute drive of the Inn on Mill Creek B&B. And for those of you who can’t make it this fall season, we will be continuing our tradition of posting weekly fall foliage reports right here on the blog starting Tuesday, September 29. 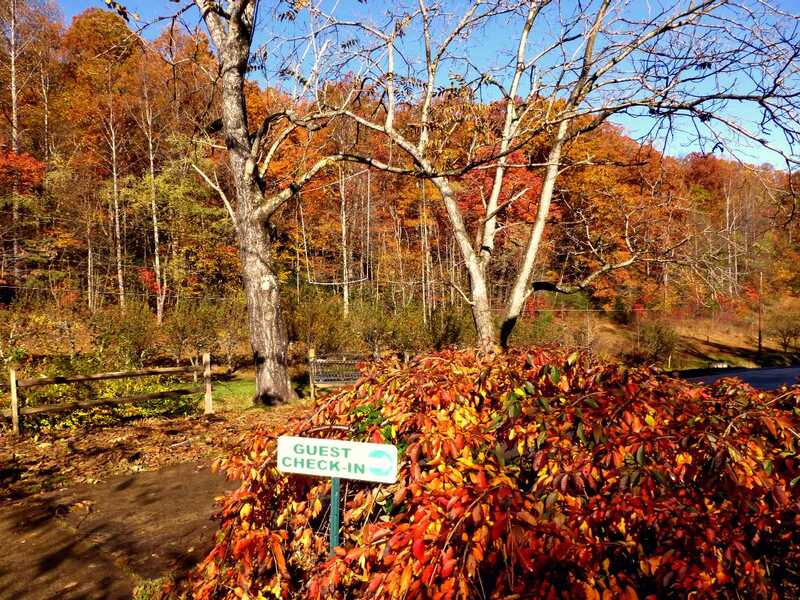 This entry was posted in Fall near Asheville and tagged fall foliage, fall season by Inn on Mill Creek. Bookmark the permalink.